Suddenly, there is plastic tape everywhere. Throughout the Greater Daglan Area, or GDA, it’s been hung from post to post, along roads and driveways. If the tape were yellow, you’d think that the most of the GDA had become a crime scene. But it’s not yellow tape — it’s red-and-white plastic, fluttering in the breeze. Red and white plastic tape, fluttering beside a road. So what’s the reason? 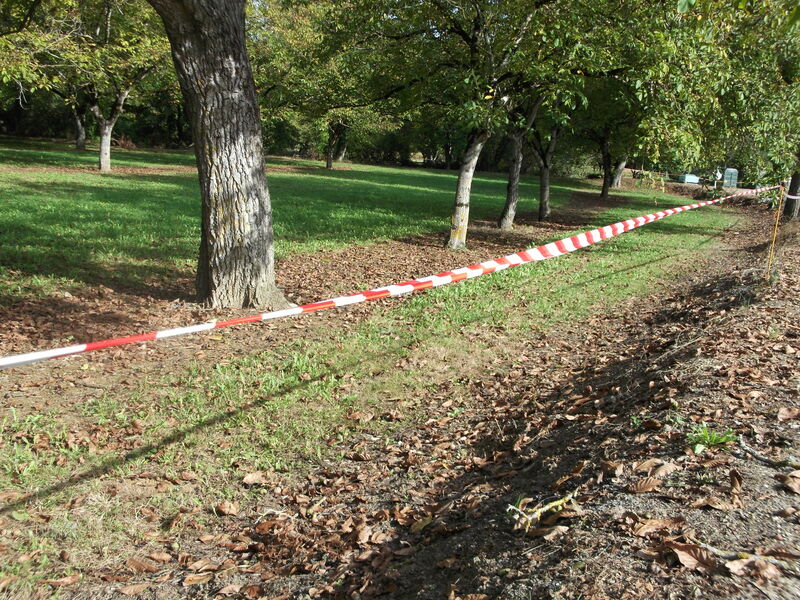 It’s simple: The tape is marking off walnut groves, and is meant to keep unauthorized walnut gatherers away from the trees, and the nuts that have fallen to the ground beneath them. The rule is that walnuts found on a road are fair game: They can be picked up by anyone. But the walnuts lying within the groves themselves belong only to the owners of the trees. So in short, all the red-and-white tape we’re seeing these days is a sure sign that the walnut harvest is about to get under way. Unauthorized pickers: beware! This entry was posted in Agriculture in the Dordogne, Flora and fauna, Life in southwest France, Weather in the Dordogne and tagged Daglan, Dordogne weather, nature, walnut harvest, walnuts. Bookmark the permalink. John, you’re exactly right. These are the handy little tools that we see all over the place now. For Jan and me, however, we have chosen the easy way out (as usual) — we buy walnuts, already shelled, in nice little plastic packets in the supermarket! We have discovered the origin of the first firewall, Ingenious!